The new trend elder care is quickly moving towards family focused care. The results have been exceptional as all stakeholders are reporting better outcomes. Caregiving roles, both paid and unpaid, are extremely complex. Time and compromise are the keys to becoming a caregiver. Surveys consistently show that the majority of seniors want to stay in their own home as they age. A number of eldercare technologies can make doing so safer for them. Many of these technological advances have been geared towards the families of the elderly. Innovation in technology has changed all our lives significantly. Technology has had little positive impact on the lives of our senior loved ones who are living independently at home. Communication tools: One of the most innovative tools in terms of communication has been built by Mavencare. Mavencare has built its eldercare technologies to provide home care with revolutionary convenience, quality, and transparency. Mavencare’s cutting edge mobile technology provides updates throughout the home care appointment straight to senior’s family and loved one’s phone. Read more. Safety: Any vulnerable senior that lives alone should have a Personal Emergency Response System. This device allows the senior to signal for help with the simple push of a button. Safety is especially a concern for those who suffer from Alzheimer's disease and are prone to wandering. A number of tracking devices monitor a senior's location thereby giving peace of mind to the families of the elderly. Mental and Physical Exercise – Games get seniors minds and bodies working: Many of the Long-Term Care Facilities have benefited from recreational games, which stimulate the elderly both physically and mentally. Recently, there have been technology-based games geared towards the elderly who are aging at home. Online Medication Management: One significant challenge families face is keeping track of their loved one’s medication intake. Those with dementia can easily forget or be confused and are at risk of taking the wrong medication, incorrect doses or medication at the wrong time. Of course, the pillboxes help but there are several technological software solutions, which serve as medication reminders. Tracking health information: There are quite a number of smartphone apps and web portals, which can track a senior’s medical history, medication schedule, key physician contacts, and medical progress. These tools can be easily accessible by health care professionals are useful to them in receiving the most up to date information. The elderly and their families are not the only ones benefiting from elder care technologies. Paid and unpaid caregivers are big benefactors of the latest technological innovations in this sector. Mavencare has always considered its caregiver workforce as integral to its business and accordingly has deployed many of its technological resources to building out useful tools for its caregivers. Mavencare successfully finds jobs for its caregivers based on the caregiver’s location, personal and cultural interests, and skills sets. We are witnessing an unprecedented period of time where there is a vast development of eldercare technologies in optimizing all aspects of everyday life. Technology for elder care has great potential for improving the quality of life for all stakeholders, who include the senior herself; the family of the loved one and the heath care practitioners. In-home monitoring: Click here to check out a demo of Mavencare's smartphone app. As our population ages, there is a greater probability a larger proportion of the population developing a disability or chronic illness. Many of the elderly are unable to perform one or more self-care tasks such as the activities of daily living. Naturally, the elderly require more health care services than the rest of the population and ultimately absorb higher health care costs than any other demographic. Eldercare technologies can reduce these costs and can ultimately better the lives of the elderly and everyone around them. 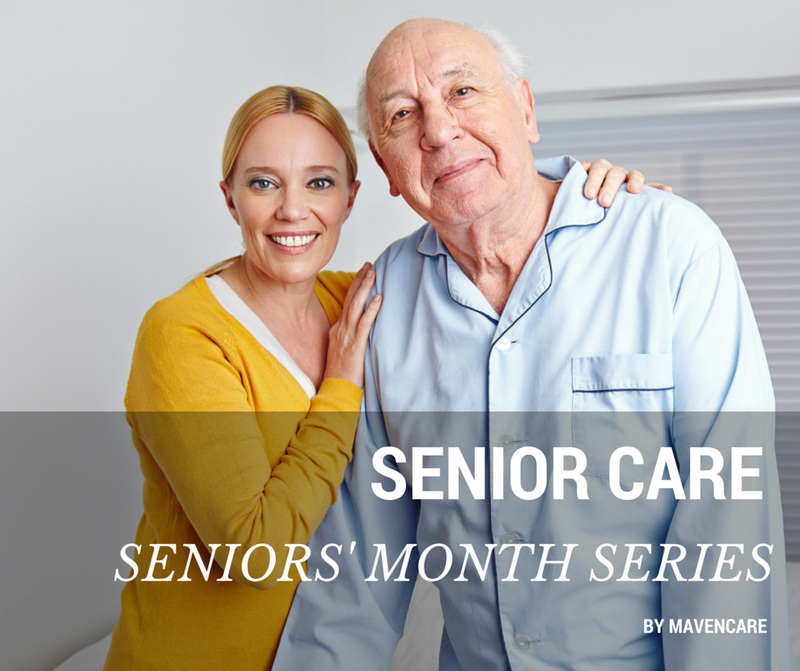 Stay tuned for our next post The Role of the caregiver as a part of our Seniors' Month Series. Subscribe to our mailing list! With a rapidly growing senior population, it is time for us all to take part in the burgeoning senior care industry in a meaningful way. Older adults overwhelmingly express a desire to age in place--83% of seniors have asserted that they want to live in their own home or their families home. Becoming a caregiver for an aging loved one can deal a serious blow to a family caregiver's career and personal life. Since the vast majority of spousal caregivers are either in or nearing retirement when their partners start to require care, it is the careers of adult children that are hardest hit by caregiving responsibilities. Forty-three percent of sons and 42% of daughters agree or strongly agree that their professional career has suffered as a result of their caregiving while 15% of husbands and 25% of wives say the same. One-quarter of daughters had to quit their job to attend to a parent in need, compared to 17% of sons. An additional 29% of daughters and 32% of sons had to reduce their working hours to help care for their parents. As our population ages, and the family caregivers are sandwiched between generations, communications and technology will be key to managing expectations for the care of the elderly. Talking openly and regularly. Keep everyone up to date on your loved one’s seniors care needs and condition. Family members who don’t share the day-to-day caretaking experience may not fully appreciate the situation. Encouraging family members to evaluate what they can reasonably and honestly do. Changing roles and varying resource levels can impact family involvement. Welcome different viewpoints, accept limitations, and be willing to try alternate strategies. Share your list of needs and take advantage of all offers to help. Recognizing your own feelings and discussing disproportionate tasks. Harboring resentment, when you need more help, can lead to your burnout and impaired health. Ask directly for concrete support and specific time commitments. Consider establishing an online calendar to organize relief and reconfirm schedules. Using technology to bridge distances. Try free video conferencing services to hold family meetings at times that work for everyone. Create a web-based community to share updates and explore options for seniors care. Exploring a family respite cooperative. Consider trading respite services with other caregivers and their families. Pooling resources with others in the same situation can encourage greater involvement, reduce costs, and increase flexibility. Participating in support groups. Learning how other families cope can suggest new options and provide reassurance. When siblings are unable or unwilling to share the load, peer support can be invaluable when it comes to seniors care. Celebrate senior's month by better education and open communication! It will result in better outcomes for seniors care.